Looking to get that perfect piece of music gear you’ve been waiting to buy?! Don’t have the money now?! Our Layaway plan is for you. Normally we offer a 30 Day period with 20% down BUT For Tax Return Season we are EXTENDING the period to 45 days and LOWERING the deposit to only 15% down! You can put down a deposit and make sure the item of your dreams is ready for you when you get the cash! Also, we can special order any item you desire. Your deposit can activate an order for any item we don’t have in stock. 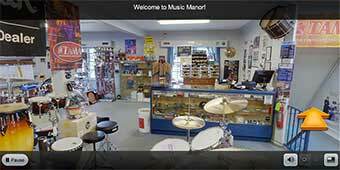 Take a virtual tour of The Manor!